The lights went out in the arena and then when they came back on, Elias was on the stage with the guitar. The fans cheered since he's a face, plus they were probably sick of Corbin already. That didn't last because Corbin said that the match was a No DQ match, so the match continued. Analysis: The pinatas are ridiculous. They aren’t necessary. At least they aren’t riding lawnmowers to the ring like the Mexicools. That's…progress? I guess. 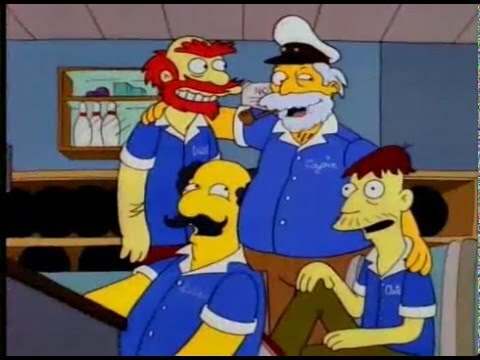 These guys could make the Stereotypes bowling team on The Simpsons. They begged Apu to be on the team! Analysis: Lars Sullivan is a big guy that will get a huge push because Vince McMahon loves his look as a thick dude that looks like a badass. He's boring and I'm not excited about it. There are so many better talents in NXT right now that could help Raw. The Raw Tag Team Champions, AOP, made their entrance with manager Drake Maverick, who thankfully was wearing dark pants this time. Bobby Roode and Chad Gable were shown backstage with Charly Caruso interview them. They did a generic promo about becoming Raw Tag Team Champions. They made their glorious entrance. The announcers argued about Drake Maverick’s peeing incident, which made me wish I was watching something else. I just yelled out "SERENITY NOW!" Thank you Frank Costanza. Analysis: 3/4* Boring match that meant nothing in terms of storylines and it was just a way to fill time. Mahal grabbing chinlocks multiple times in five-minute matches isn’t fun to watch. I know it’s part of wrestling to build to the comeback, but the crowd was asleep. No crowd reaction at all. I don't blame them. This sucked.